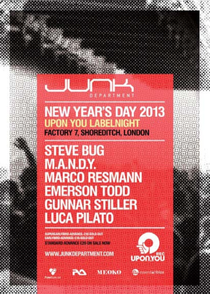 Junk Department are back in the capital at Factory 7 this New Year’s Day with a fully loaded underground party showcasing the uber-cool Berlin based label Upon.You. It touches down with the likes of Steve Bug, M.A.N.D.Y. and more, alongside Junk Department residents and two special guests.